I like that the Pixy has servo headers for doing stand-alone pan/tilt. I also like the idea of having some IO pin breakouts for other stand-alone uses. It's nice when you don't have to add an extra mcu for simple applications. I like that it can support several camera options. One interesting idea is a low light/IR camera. Of course color tracking wouldn't work so well in that case, but other type of MV might. I like the idea of using SDRAM with the 429 part. I have no idea what I'd do with a few GB of RAM, but no one has ever complained that their microcontroller had too much RAM. The extra speed over the 407 part would be a bonus, too. I think the SD card sticks out too far in the current version. I know this is asking for the moon, but I'd try to rework the board to minimize that. I personally would like all unused I/O pins from the microcontroller to be brought out to headers. On a board that size, clearly that's a challenge. Maybe put a high-density socket like the connector for the camera on there and package the OpenMV with a breakout board that takes those signals out to 0.1" centers. I think the biggest barrier to adoption is going to be the difficulty of setting up a development environment for the ST parts. I have a five-part tutorial series on my blog going over this in detail, and it took a LOT of research to get up and running. (http://thehackerworkshop.com/?p=391) In order to promote adoption I think it's necessary to buy/build/find/make/steal a one-click dev environment installer. This is why the Arduino is so popular: they make it easy to get started. Their IDE is crap, there's no debugging facilities at all, the resulting code is slow... but it's easy to get started. Seriously, no matter how polished and ready the hardware is, don't take it to market until you get this part down. You won't have a second chance to enter the market. In order to be "The Arduino of Machine Vision" you **have** to solve this problem. I have dev environments up on both my Windows machine and my Ubuntu machine for the STM32F0/F4 parts, so it can be done, but you have to make it EASY. It looks like Ibrahim has a good start on this with his IDE. This IDE, not the hardware, is what's going to sell the product. The second thing you'll need to become "The Arduino of Machine Vision" is a community. Before creating a Kickstarter campaign, create a discussion forum somewhere. Build a software repository that makes it easy for people to share code. Go ahead and use a Git or Subversion back-end, but be sure to have a plain old web interface for novice users to get library files without having to install or understand a source code client tool. I think that Ibrahim has developed a fantastic hardware solution, and I will absolutely be a Kickstarter backer (assuming you won't sell one to me earlier). But I'm not your target audience. I'm a guy who's willing to spend weeks putting together a build environment and blog about it. Your target audience wants to buy the thing, power it on, and have it start doing cool stuff out of the box. Then, they want to go online and download other cool solutions without understanding the hardware. Only after they've marvelled at what is provided will they take the time to peel back the covers and look under the hood and say "wouldn't it be nice if..." So you need to provide some "Wow!" demo software and make it easy for them to dig in deeper. Then you need to provide tutorials and examples and community support. That, in my very ignorant opinion, is how you become "The Arduino of Machine Vision." If I can help you develop this product, please let me know. I'd be proud to be associated with a project like this. You can email me at my first name at my domain name dot com. Awesome thoughts and suggestions. I'll get in touch with you in email, Matthew. I think that it would be really cool to be able to put 2 units together and then using the detected objects figure out how far away the detected objet is (assuming you know the distance between the 2 cameras. Definitely! I'm thinking stereo detection of the red AVC barrels! :) Thanks, Dave. Great tip, thanks Don. You wouldn't happen to have a link or name handy? 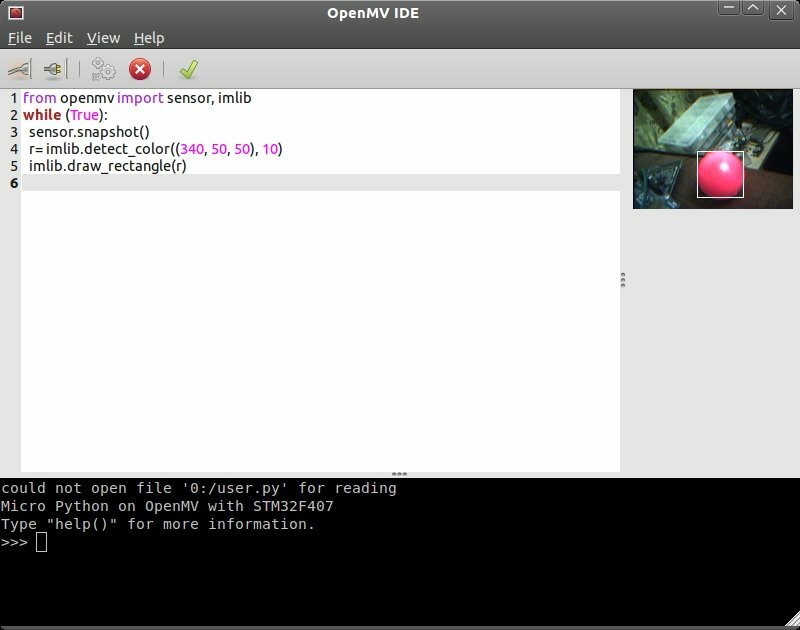 CCV (http://ccv.nuigroup.com/) is open source software that " takes an video input stream and outputs tracking data (e.g. coordinates and blob size) and events (e.g. finger down, moved and released) that are used in building multi-touch applications." The only problem is that you need a PC to run it, which is a large form factor and costs $$. The OpenMV could potentially accomplish the same result but with a small footprint and low cost! It should be able to read IR blobs (fingers pressed against glass) or laser pointers and output x,y coordinates. I attempted to use a Wii Remote for this, but the low resolution of the camera and short effective distance (< 1m) prohibited it from working as a touch screen solution. Could it detect a house from any angle? It could then be used for navigating a robot. And once Google opens up street view with an SDK, we could use their data as a reference input to OpenMV to navigate with much more precision than GPS! Let me put the OpenMV on my AR glasses, and highlight the objects in front of me that are moving, even while I'm turning my head. Put two OpenMV's on the Oculus Rift or an Android Tablet. Cheap but robust AR capability. Add a laser, telephoto lens and time of flight metric to get a laser range finder?